The eneloop pro, 4-position Ni-MH battery charger delivers advanced, individual cell charging capabilities. 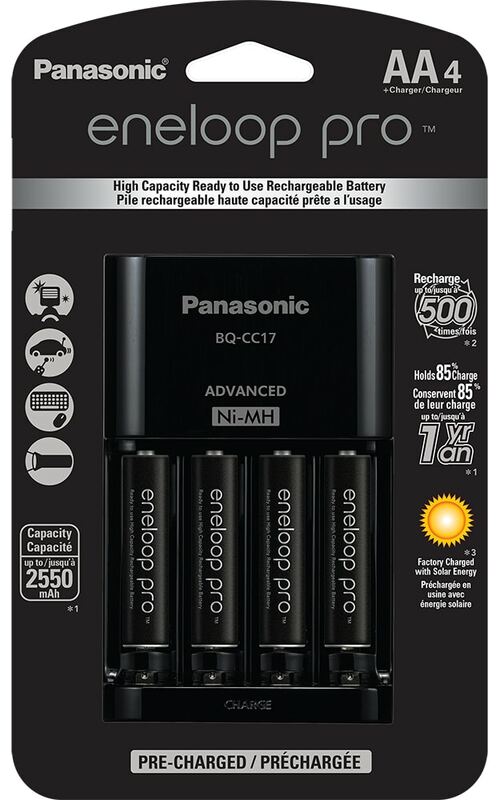 Ideal for use at home, in the office, or on the road, this charger is a convenient way to recharge any combination of up to four AA or AAA Ni-MH eneloop, eneloop pro, or conventional Ni-MH rechargeable batteries. The charger also features 4 LED charge indicator lights and a retractable AC plug. This advanced AC charger is designed to charge battery cells individually; allowing you the freedom to completely charge fully discharged cells or just “top off” the charge of AA or AAA cells that are only partially drained. The single cell charge capability allows any combination of one, two, three or four AA or AAA Ni-MH batteries to be charged at the same time.